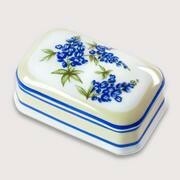 Inspired by the beloved Bluebonnet China pattern, this box expands the collection beyond the tabletop place-setting. The delicate porcelain box measures approximately 3-by-4 1/2 inches. 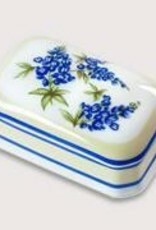 It is the perfect size for treasured keepsakes, jewelry, or even artificial sweetener packets for your table setting. This wonderful box featuring the Texas state flower in full bloom is a must-have for bluebonnet lovers and the perfect hostess gift when traveling!